As much as I want my life around me to stop so I can catch up, it doesn’t. Life still goes on. Days pass and the feeling of not being able to catch my breath and organize my thoughts continue. Until now…. Its time for a fresh perspective. Its time to remove the toxic people out of my life who don’t support me or encourage me or love me without conditions. When I walk through an open door, I choose who I want to walk with me through it. I don’t have to settle for family relationships that leave me feeling empty and bitter. I don’t have to keep friends who intimidate me or fail to encourage me. We only have one life to live! I choose to walk through a new door and leave behind the family members who have abandoned me in my grief. I choose to leave the drama behind me in regards to decisions I have made that people disagree with. I choose to live with a clean heart and a fresh start. This week I will be traveling to Indiana to pack and move my Mom to California! Now THIS is opening a new door! Wayne, Hannah and I will be driving from Indiana to California with my Mom and nephew Shea. We are going to make this trip as fun as possible! Scheduled stops are Branson, MO: Fort Worth, TX: Waco, TX (yes, Magnolia Farms here we come! ); Amarillo, TX and Albequerque NM before heading home and our new life together. I hope to treat you to posts and pictures along the way. 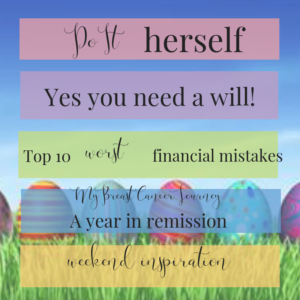 In the meantime, I’ll finish up my hysterectomy journey on the blog and tell you a little about ME and whats next for the blog. FREE printables and a sweet birthday!